“Thirty years have passed since the deafeat of the evil Galactic Empire, but the threats of turmoil are rising. To stem the tide of the First Order, a military force aiming in secret to overthrow the New Republic, General Leia Organa has founded the Resistance movement. 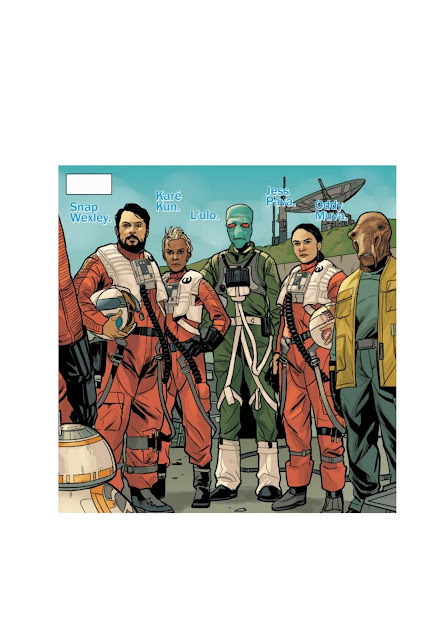 Looking to expand her forces, Organa has recuited the best polot in the galaxy- Poe Dameron. 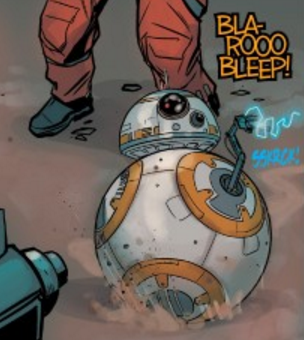 Now, with the help of his droid BB-8 and squadron of fighter pilots, Poe must act quickly to defeat any threat to the republic that comes his way, no matter how deadly the risks…"
The Poe Dameron comic release was announced back in January of this year right after the explosion that was The Force Awakens. The world had fallen in love with Poe on screen, but the movies didn’t give us the full story. The comics would center around him, before the timeline in the movie, and allow for more character development and background information. The art is done by Phil Noto, who has a unique style from most of the other comics I read, which is always something I look for between franchises and between comics, so I really enjoy that. It’s always fresh to look at and fits very well with the story’s aesthetic. 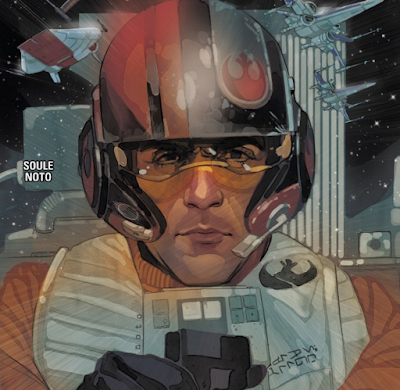 The story is written by Charles Soule and is a new and fresh team with Poe and BB-8’s familiar faces. It’s innovative but still familiar enough for the Star Wars veteran. The characters in these first threee issues are probably my favorite thing. They're still going along with the whole "innovative but familiar" vibe in the best sort of way. 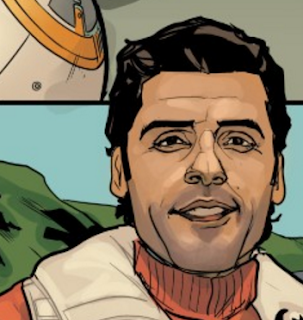 Poe Dameron is the best resistance pilot there is--which is why he is under the direct command of General Leia Organa. Across the galaxy, people are selling information to the First Order to gain their favor, hopefully before they turn into something as great and evil as the Empire. The resistance has managed to intercept key pieces of the information at stake, and it's become clear that the first order is searching for Luke Skywalker. 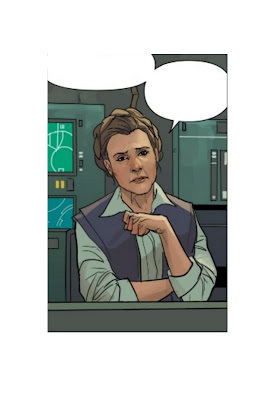 Leia believes that it's imperative that the resistance find Luke first--she knows of an explorer named Lor San Tekka who travels to sacred Jedi sites and ruins and might have information on where Luke may be. She believes him to be still alive and sends Poe to his last known location to try and track him down. Poe rounds up his most trusted allies--Black Squadron--and they head out to find him. When they get to the site, Poe breaks off from the crew to find that the underground of the planet is inhabited by the Crèche, a people who devote their lives to taking care of their "savior unborn," a big glowing egg strung up from the ceiling. They divulge that Lor San Tekka had been there but left some time ago. While Poe is trying to gain their trust (and their information on Tekka), Agent Terex of the first order shows up with an army. 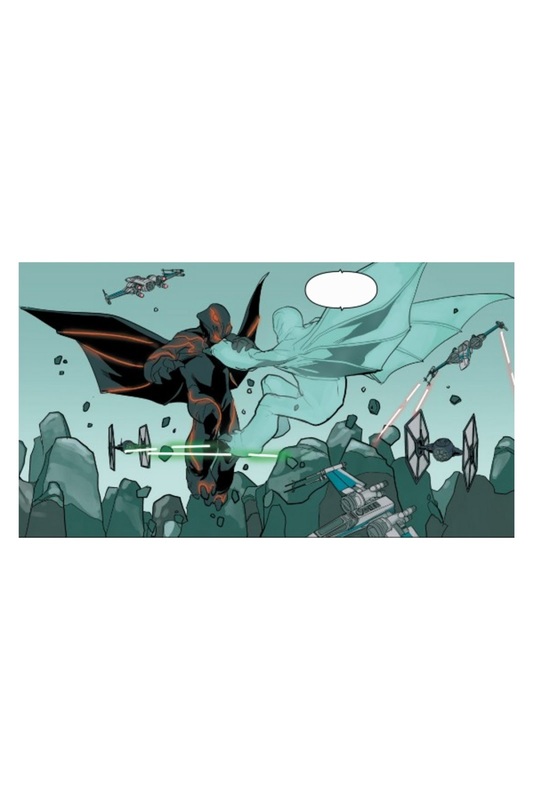 With Poe trapped below, Black Squadron is having a hard time fighting off the First Order's aircraft. Low on fuel and communications down; things look bad for the resistance. But suddenly wait--what the heck?! 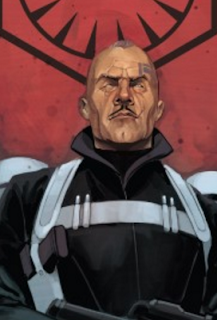 Find out what on God's green Earth those things are and how Black Squadron is going to get back to the Resistance in Marvel's Poe Dameron. My favorite part of all three issues is tied between two moments. 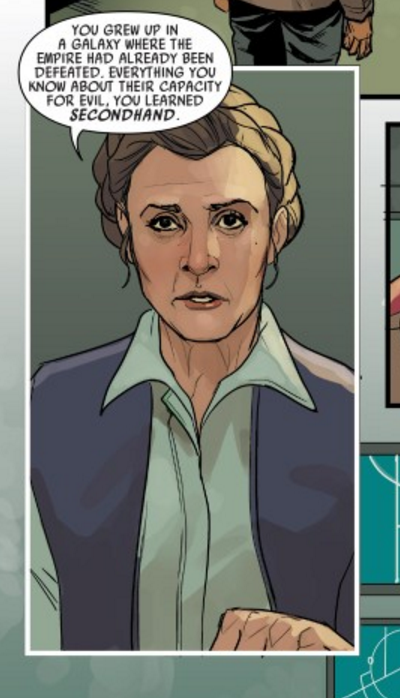 In one panel, Leia is lecturing Poe for his reckless eagerness to get out there and fight the first order. She warns him that they could one day be like the empire and that he'd better be careful as he doesn't know exactly what he's dealing with. My second favorite part is the almost-reference to The Wizard of Oz because everyone likes a good crossover. 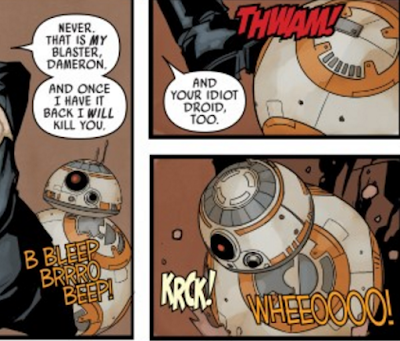 "I'll get you, Poe Dameron! And your little droid too!" YES. 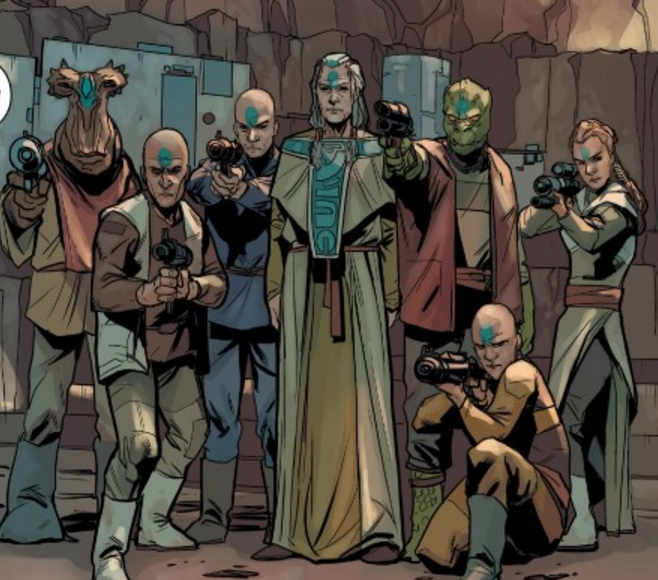 I recommend this comic for Star Wars fans of all ages, shapes, sizes, and knowledge. It's a good place to start if you're just getting into the fandom (or if you're just now starting to read comics) or if you're a more seasoned veteran. Everyone will love the wit, the suspense, and the familiar humor. Soule and Noto did a fantastic job, and I couldn't have dreamed of a better comic. Gosh, Molly, did you dislike ANYTHING? Alright alright, so when you get to the big glowing monster guys, it's very unclear what's going on and I don't feel it was resolved too well. It confused me, and I read it over three different times, yet I'm still lost. So, there were some drawbacks, but nothing I would say makes the series any less worth reading. 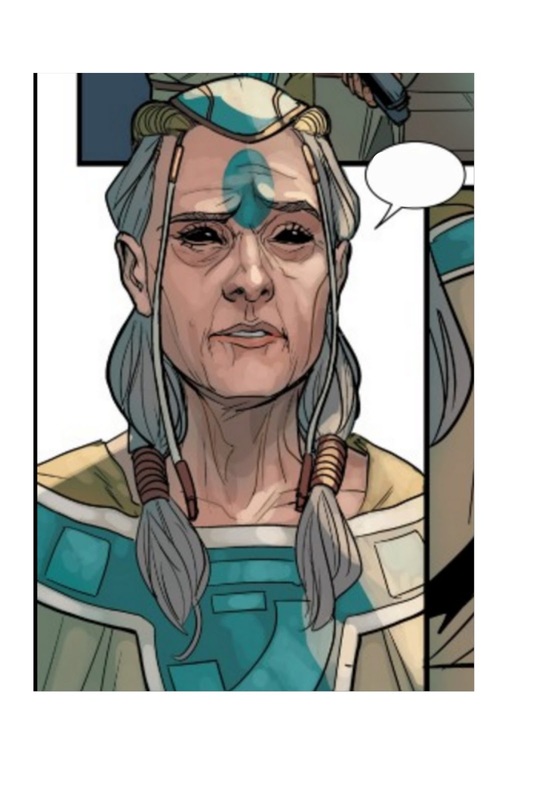 The comic has great art, a great story line, and a unique cast of characters. The story line is new, but not out of character for anyone and doesn't throw any timelines out of whack. The hard copies aren't too expensive. Issue one is $4.99 and issues two and three are $3.99 so the prices are pretty streamlined with the rest of Marvel's sales. The new issue will be out July 6th so you better hurry! This post has been brought to you by my undying love for Poe Dameron.